The Province of Schleswig-Holstein (German: Provinz Schleswig-Holstein, pronounced ) was a province of the Kingdom of Prussia and the Free State of Prussia from 1868 to 1946. It was created from the Duchies of Schleswig and Holstein, which had been conquered by Prussia and the Austrian Empire from Denmark in the Second War of Schleswig in 1864. Following the Austro-Prussian War in 1866, which ended in Austrian defeat, Schleswig and Holstein were annexed by Prussia. The province was created in 1868 and also included the Duchy of Lauenburg since 1876. Following the defeat of plebiscites in Northern and Central Schleswig on 10 February and 14 March 1920, respectively. In Northern Schleswig 75% voted for reunification with Denmark and 25% for staying with Germany. In Central Schleswig the situation was reversed with 80% voting for Germany and 20% for Denmark. No vote ever took place in the southern third of Schleswig, as it was considered a foregone conclusion that almost all the inhabitants would vote to remain in Germany. 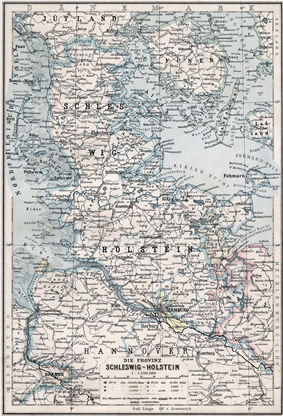 On 15 June 1920, Northern Schleswig was officially reunited with Denmark (see: South Jutland County). The remainder of Schleswig remained part of Schleswig-Holstein, now a province of the Free State of Prussia. With the Greater Hamburg Act of 1937, the Hanseatic City of Lübeck and the Oldenburgian exclave Region of Lübeck were incorporated into the Schleswig-Holstein province, while a number of Hamburg's adjacent municipalities, among them the city districts of Altona and Wandsbek, were incorporated into the Hanseatic City of Hamburg. This again ceded its exclaves of Geesthacht and Großhansdorf to Schleswig-Holstein. After World War II, Schleswig-Holstein was part of the British occupation zone, although some municipalities of Schleswig-Holstein east of Ratzeburg were exchanged for municipalities of Mecklenburg in the Soviet occupation zone (Barber Lyashchenko Agreement). The British-occupied section became the new German state of Schleswig-Holstein on 23 August 1946, which joined the Federal Republic of Germany on 23 May 1949. Map of the Province of Schleswig-Holstein as of 1905. ^ Elklit, Jørgen; Noack, Johan Peter; Tonsgaard, Ole (1980). "A National Group as a Social System: The Case of the German Minority in North Schleswig".